If you’re crunched for time and need to get in a quick workout, you can prioritize your mode of exercise based on your goals. Once your goals are in place, shifting activities and doling out time to each is easier. Read on to learn more about strength and cardio timing to help decide what’s right for you. If your goal is to maintain general fitness, weekly strength and cardio exercise should be a priority. When and how you do it doesn’t really make a difference. A study in The Journal of Strength and Conditioning compared maximum oxygen consumption in strength exercises paired with aerobic activity in the same session. Researchers found there was no significant change in oxygen consumption that negatively impacted overall performance. The moral of the story? If your goal is to stay healthy, make time for both resistance training and aerobic exercise. But if including strength and cardio feels like a chore, it can be hard to balance each week. Many gym-goers lose their enthusiasm when exercise becomes too routine because they churn through the same workouts every week. Check your gym schedule to find new classes, or partner with a friend for buddy workouts. Take your workout outdoors or switch up your treadmill stint for a jaunt in the “mountains.” The key to staying fit and healthy is to make exercise fun. The jury is still out as to whether strength training alone will encourage weight loss, but it does improve body composition. Your best bet when it comes to fat loss is a combination of strength and cardio training; if you are in a bind, cardio alone will do the trick. The Journal of Applied Physiology published a study on the effects of aerobic and/or resistance training on body mass and fat mass in overweight adults. The study concluded that resistance training alone improved lean body mass, which changed body fat percentage. However, it did not reduce absolute fat mass. Participants who performed both resistance and cardio exercise did not see a difference in body mass or fat mass change over those who performed cardio exercise on its own. The conclusion? Aerobic exercise still stands as the fat loss king. Add a brisk 30 minute evening walk to your day, join a cycling class at your gym, or skip rope for 10 minutes at the end of your workout to reap cardio benefits. Before you abandon or reject the weight room, know that resistance training offers far more benefits beyond reducing fat stores. Pumping iron or even your own bodyweight increases lean body mass, improves bone density and joint health, and increases your body’s ability to burn more calories throughout the day, a process known as excess post-exercise oxygen consumption (EPOC). The takeaway for people who’d like to lose weight: Aerobic exercise is a surefire way to kick start your goals, but weight training can totally transform your body composition for the better. This one is pretty simple. If you are training for an endurance event, you should definitely prioritize aerobic exercise over strength training. If you are training for a strength event like powerlifting or strongman, then resistance training trumps cardio. Ideally, you would separate aerobic and strength training into two different sessions on different days. If you choose to double up on sessions, try to space them out so your event workouts are in the morning and non-event workouts are in the evening. 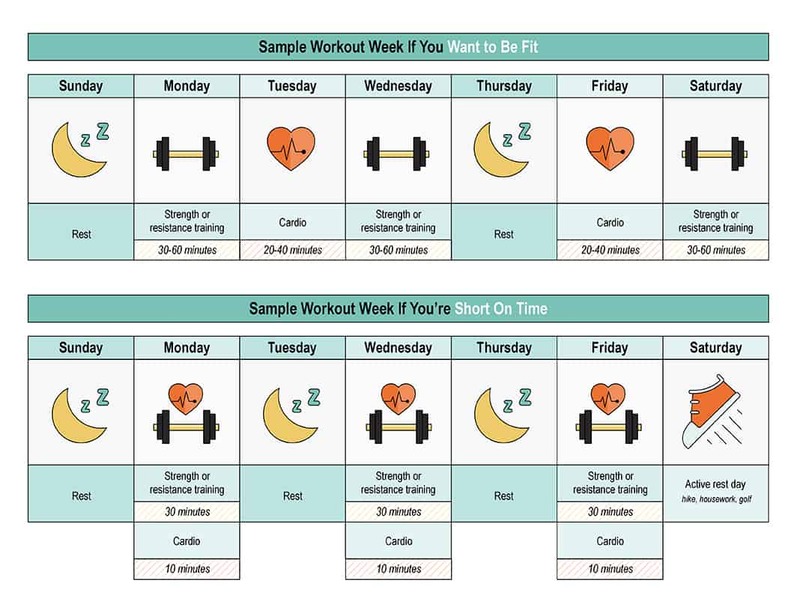 Your training week should consist of more event-type than non-event workouts. For example, if you are training for a half marathon, you could schedule runs with two to three strength-training sessions per week. If you are training for a powerlifting meet, plan your weekly strength sessions (usually four to six workouts) and add a few additional bouts of cardio that last 15 to 20 minutes each week. 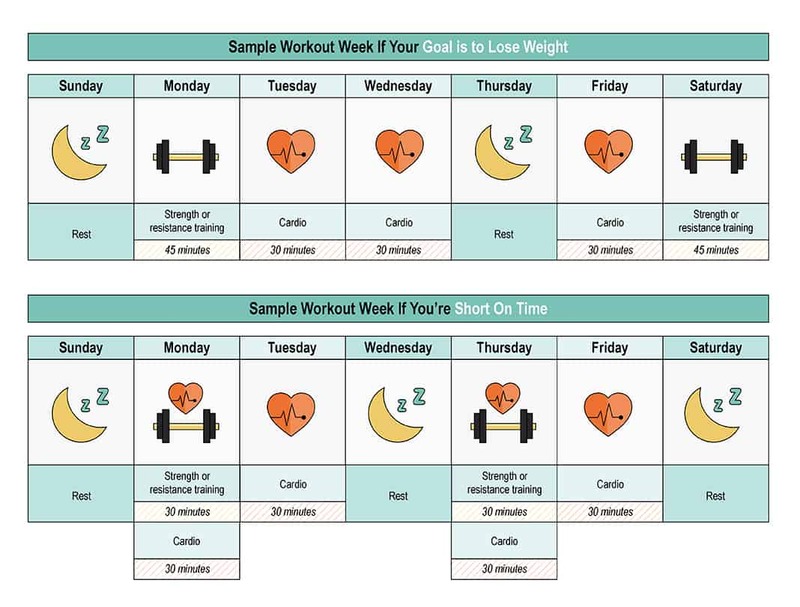 Schedule your workout week based on your goals and the amount of time you have to devote to training. If you want to get stronger, prioritize strength training. If you want to improve endurance or lose fat, hit your cardio first. A solid workout week will include both aerobic and resistance training exercise. For general wellness, stick with what you love most so you can stay on track. Make it fun, mix it up, and try something new so you stay consistent and improve your health.